Corpus luteum cyst may present with delayed menstruation, pelvic pressure and gastrointestinal discomfort. The corpus luteum cyst may present as unilateral cyst. The cyst consist of clear fluid. The corpus luteum mostly occur during the menstrual period. The corpus luteum usually line by cytoplasmic droplets of lipid and yellowish luteal cells. The treatment of corpus luteum cyst will focus on removal of the corpus luteum cyst surgically or unilateral oophorectomy. The common complication of corpus lutuem cyst is the transformation into mature corpus luteum which will bleed/ hemorrhage. Follicular cyst may present with abdominal pain or pelvic pressure/pain. 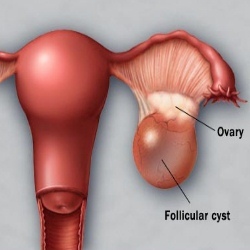 The treatment of follicular cyst may focus on oral contraceptive pills and laparoscopic surgically removal of the follicular cyst. The follicular cyst is associated with hyperplasia of the endometrium. The follicular cyst is bilateral and lined by granulosa cells. Follicular cyst is presented as distention of the Graafian follicle. Theca lutein cyst may present as multiple and bilateral masses which are lined by luteinized theca cells. Patient may present with abdominal pain or pelvic pressure and gastrointestinal discomfort as well as amenorrhea. The treatment of theca lutein cyst may focus on removal of the cyst or unilateral oophorectomy. Theca lutein cyst may be multiple and bilateral in nature.There is an elevation of the hCg level due to proliferation of the trophoblastic. Theca lutein cyst is lined by luteinized theca cells.Occur due to clomiphene intake, choriocarcinoma and hydatidiform moles.